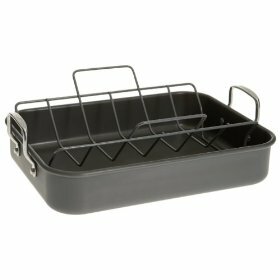 During the holiday season, and for many occasions in between, its nice to have a nonstick roasting pan like the Circulon roaster. This particular line of products is designed to stand up to heavy use and high heat cooking. The hard-anodized aluminum construction indicates that this pan should roast evenly to make a perfect turkey or roast. Lets take a closer look at this products attributes. Other good features include 18/10 stainless steel handles, medium-high roasting sides for those tall orders, turkey lifters that make it safe and simple to get your bird to a resting spot while you make gravy from the drippings, and a limited lifetime warranty. If youre roasting without a cooking bag, youll need to babysit your food  checking on it about every 30 minutes for moisture levels. This, of course, deters even cooking because you constantly have to remove the lid. The price on this pan is $100, but you can find them on sale for around $50 , which is a budget-friendly price for a pan that youll own for many years. Other than the problem with evaporation, consumers seem to LOVE the Circulon roaster. They like the fact that it is a very sturdy pan thats a good fit (16 x 13) for nearly any oven. The pan easily accommodates a 20 pound plus turkey! The handles on both sides of the roaster face upward instead of out, making it safer to maneuver in and out of the oven. Comments were made that the rack is a great size for keeping air circulating around the food. Additionally the nonstick surface of the roaster delivers on its promise time and again  being very easy to clean up. One request from consumers: they would like an option for a lower rack. The included one sits up too high for some larger birds to fit well in the oven.